ISLAMABAD (Reuters) – Pakistan intensified its crackdown against Islamist militants on Thursday, with the government announcing it had taken control of 182 religious schools and detained more than 100 people as part of its push against banned groups. The move represents Pakistan’s biggest move against banned organisations in years and appears to be targeting Islamic welfare organisations that the United States says are a front for militant activities. Pakistan is facing pressure from global powers to act against groups carrying out attacks in India, including Jaish-e-Mohammed (JeM), which claimed responsibility for the Feb. 14 attack that killed at least 40 Indian paramilitary police. 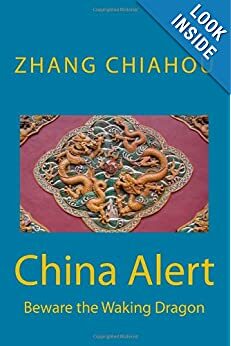 The escalating tension in the wake of the bombing led to a major confrontation between the nuclear-armed rivals, with both countries carrying out aerial bombing missions and even engaging in a brief dogfight that prompted fears of a war. Pakistani officials say the crackdown is part of a long-planned drive and not a response to Indian anger over what New Delhi calls Islamabad’s failure to rein in militant groups operating on Pakistani soil. Previous large-scale crackdowns against anti-India militants have broadly been cosmetic, with the proscribed groups able to survive and continue operations. The interior ministry said law enforcement agencies had placed 121 people in “preventive detention” as part of the crackdown that began this week. “Provincial governments have taken in their control management and administration of 182 seminaries (madaris)”, the ministry said in a statement, referring to religious schools. What to do with madrasas is a thorny issue in Pakistan, a deeply conservative Muslim nation where religious schools are often blamed for radicalisation of youngsters but are the only education available to millions of poor children. The interior ministry said other institutions from different groups had been taken over, including 34 schools or colleges, 163 dispensaries, 184 ambulances, five hospitals and eight offices of banned organisations. Jamaat-ud-Dawa (JuD), which operates hospitals and a fleet of ambulances, is estimated to run about 300 madrasas across the country. Pakistan’s government banned the group this week. JuD calls itself a humanitarian charity but the U.S. State Department has designated it a “foreign terrorist organisation” and calls it a front for Lashkar-e-Taiba (LET), a Pakistan-based group accused of orchestrating attacks in India, including the 2008 Mumbai attack that killed 166 people. JuD called the crackdown unfair and said it would seek to counter the government action in courts. “The whole nation is asking that what message the government wants to send by sealing welfare organisations and kicking students out,” said JuD spokesman Yahya Mujahid. Pakistan has long used Islamist groups to pursue its aims in the region, but it has denied New Delhi’s accusations it actively supports militants fighting Indian forces in India’s part of Muslim-majority Kashmir. The South Asian neighbours have fought three wars since independence from Britain in 1947, two of them over Kashmir which they both claim in whole but rule in part. Indian authorities have killed at least eight JeM militants and detained around 50 militants, sympathizers and their relatives since the bomb attack, which also sparked the roundup of separatists which India says is needed to head off trouble ahead of a general election to be held by May. Most of those rounded up over the last two days were linked to the Islamist party Jamaat-e-Islami (JeI). “Since JeI has a wider network across Kashmir and they are mobilising anti-India protests, their arrest could help in curbing such protests ahead of elections,” the senior police officer said. One well-known separatist leader, Abdul Gani Bhat, was placed under house arrest, according to his political party. Separatists called a strike to protest against the detentions. Many shops, petrol stations, and businesses closed, with few people and vehicles on streets in sensitive areas, except for troop patrols. In some areas of the main city of Srinagar, the government limited the movement of people and vehicles. “The restrictions have been imposed as a precautionary measure to avoid any untoward incident,” the police said. The government of Jammu and Kashmir said fuel rationing had been introduced in the Kashmir Valley where there was only enough gasoline for one day, diesel for four days and no liquefied petroleum gas (LPG). The government said it would seek to increase supplies to the region and that shortages are the result of road blockages after the suicide bomb attack. Indian paramilitary troops in riot gear arrived in strength at first light, said Shakeel Ahmad, a resident of Nowhatta in the Srinagar district. “At places, they have blocked the main roads with steel barricades and concertina wire,” he said. State Governor Satya Pal Malik called on residents not to believe “rumours of any extreme nature”. The government said an increase in police numbers was to prevent candidates and voters from being intimidated into not standing or voting in the general election. Separatist leader Mirwaiz Umar Farooq, who chairs the Hurriyat Conference of separatist groups, said arbitrary arrests and jailing of leaders, activists and young people for their political beliefs had happened across Kashmir for 30 years. “Intimidating activists and leadership will not deter them from their path, nor will it stop people from demanding the resolution of the Kashmir dispute through self-determination,” he said. Reuters’ telephone calls to the Indian home ministry to seek comment went unanswered. The suicide bomb attack has raised tensions between India and Pakistan which both claim Kashmir in full but rule it in part. India blames Pakistan for harbouring militant groups operating in Kashmir, which Pakistan denies. After the attack, India dropped trade privileges for Pakistan and prepared to send as many as 10,000 more troops to the contested area, according to a home ministry letter seen by Reuters. The Indian army said that early on Sunday evening Pakistan violated the two nations’ ceasefire at the Rajouri area of the border, through shelling from mortars and small arms fire. Defence spokesman Lieutenant Colonel Devender Anand said the Indian army was “retaliating strongly and effectively”. Ceasefire violations are not unusual along the border. A Pakistani security official said Pakistani forces had not initiated any action but had responded to Indian firing. Kashmir is likely to be a key issue in India’s election, distracting from concerns about how Prime Minister Narendra Modi and his Bharatiya Janata Party have managed the economy. Modi has promised a strong response to the attack, saying in a monthly radio broadcast on Sunday that it had caused anguish to all of India. Modi added that the army had vowed to destroy the militants and those who helped them. Islamabad has warned it would respond with “full force” if attacked. On Sunday, Foreign Minister Shah Mehmood Qureshi called on India to show restraint or it would put “the entire region’s peace and security at stake”. India’s Supreme Court will hear a case this week seeking to drop a constitutional provision that bars non-residents from moving to the state of Jammu and Kashmir that encompasses the Muslim-majority region. If passed, it could further escalate tensions. BEIJING, Feb. 18 (Xinhua) — The widely used new media has become an efficient tool for China’s anti-graft body to promote information transparency. Commentary in a newspaper administrated by the Communist Party of China Central Commission for Discipline Inspection and the National Supervisory Commission said Monday netizens can find the latest information released by the top anti-graft watchdog on its website and post suggestions there. People can report corrupt practices and other violations of disciplines and laws online, such as posting on the micro-blogging site Weibo, sending a message to anti-graft authorities’ accounts on the instant messaging tool WeChat or reporting through an app run by the top anti-graft authority. Varied reporting channels have helped expose more officials violating disciplines and laws that were hard to be found out by anti-graft authorities in the past, the commentary said. Improved information transparency has also helped ensure more objective and fair investigations, it added. Anti-graft authorities can post online information of corrupt officials, including those fleeing overseas, meaning there will be more chances to capture them, said the commentary. It also said as anti-graft authorities’ articles and video clips are reaching more people online through Weibo, Wechat and their apps, people are now able to learn about the ongoing crackdown on corruption, which also benefits the anti-graft work. A recent surge of police action against churches in China has raised concerns the government is getting even tougher on unsanctioned Christian activity. Among those arrested are a prominent pastor and his wife, of the Early Rain Covenant Church in Sichuan. Both have been charged with state subversion. And on Saturday morning, dozens of police raided a children’s Bible class at Rongguili Church in Guangzhou. China is officially atheist, though says it allows religious freedom. But it has over the years repeatedly taken action against religious leaders it considers to be threatening to its authority or to the stability of the state, which, according to Human Rights Watch, “makes a mockery of the government’s claim that it respects religious beliefs”. The government pressures Christians to join one of the Three-Self Patriotic churches, state-sanctioned bodies which toe the Communist Party line and are led by approved priests. Despite this, the Christian population has grown steadily in recent years. 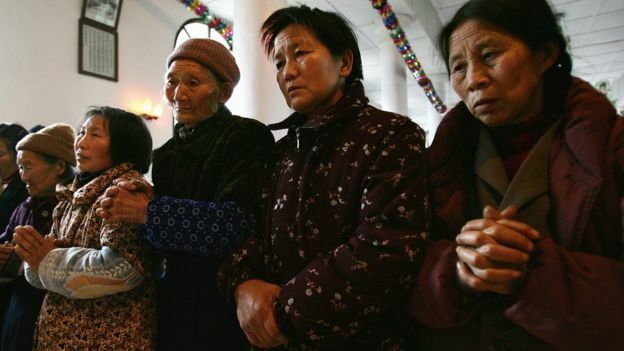 There are now an estimated 100 million Christians in China, many of them worshipping in so-called underground churches. Wang Yi is the leader of one such church, the Early Rain Covenant Church in Chengdu, the capital of south-western Sichuan province. The church is unusual in that it worships openly and regularly posts evangelical material online. The church says it has about 800 followers spread across the city. It also runs a small school. Pastor Wang is also known for being outspoken – he has been fiercely critical of the state’s control of religion and had organised a widely shared petition against new legislation brought in this year which allowed for tighter surveillance of churches and tougher sanctions on those deemed to have crossed the line. 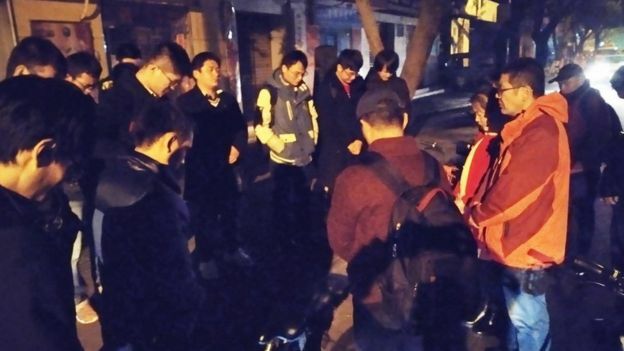 On 9 December, police raided the church and arrested Pastor Wang and his wife Jiang Rong. Over the following two days, at least 100 church members, including Wang’s assistant, were taken away. One member of the church, who asked not to be identified for fear of reprisals, told the BBC that the lock on the church school had been broken, churchgoers’ homes had been ransacked and some were “under house arrest or are followed all the time”. She said police and other officials had been going to congregants’ homes to pressure them to sign documents pledging to leave the church and to take their children out of its school. 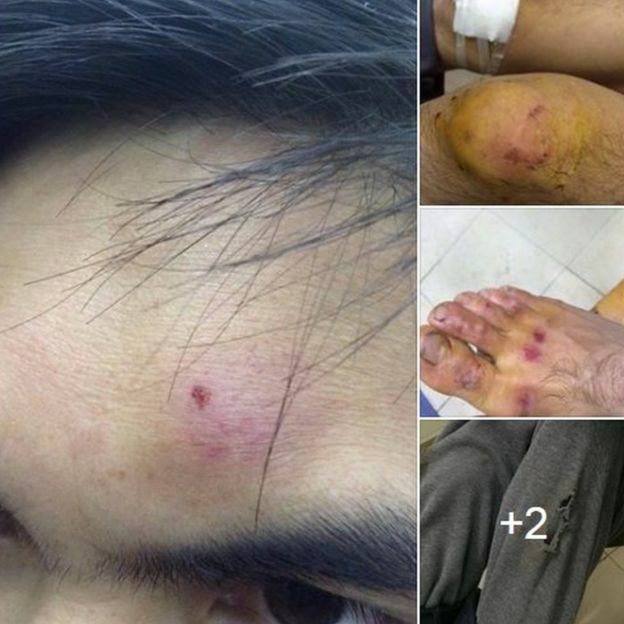 The church alleges that some of those detained and then released were mistreated in custody. 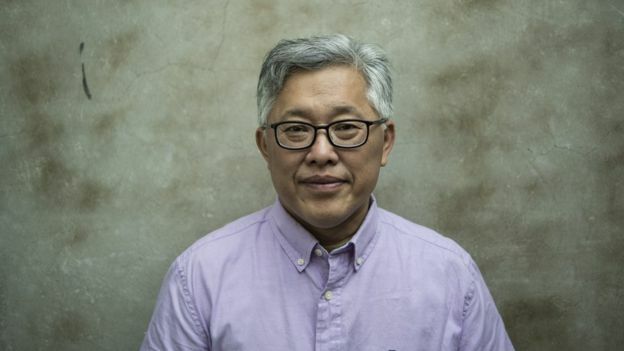 Forty-eight hours after he was arrested, Early Rain Covenant Church released a letter from Pastor Wang, which he had pre-written for release in case something like this ever happened to him. In it, he said he respected the Chinese authorities and was “not interested in changing any political or legal institutions in China”. But he said he was “filled with anger and disgust at the persecution of the church by this Communist regime”. “As a pastor of a Christian church, I must denounce this wickedness openly and severely. The calling that I have received requires me to use non-violent methods to disobey those human laws that disobey the Bible and God,” he said. 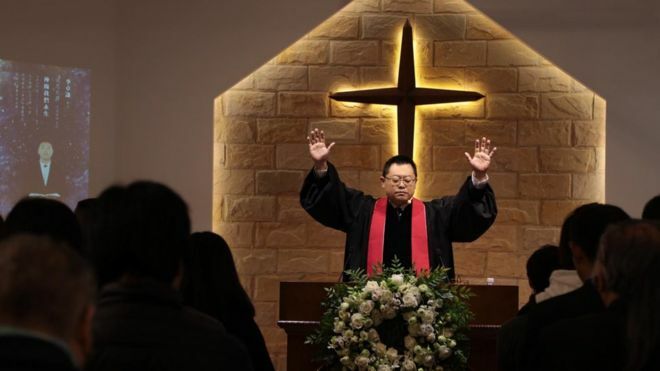 Pastor Wang and his wife – who have an 11-year-old son – have been charged with inciting subversion of state power, one of the most serious crimes against the state and a charge which is often used to silence dissidents. It carries a potential jail term of 15 years. Several senior members of the church face similar charges. Across the country in Guangzhou, the doors have also been sealed on the Rongguili Church, another un-sanctioned community. On Saturday, a children’s Bible class was interrupted by the arrival of dozens of police officers. Witnesses said they declared the church an illegal gathering, confiscated Bibles and other materials and shut the doors. Officers took names and addresses and ordered everyone present to hand over their phones. In September, the Zion church, one of the largest unofficial churches in Beijing was abruptly shut down. It had recently refused a request from the government to install security cameras to monitor its activities. “I fear that there is no way for us to resolve this issue with the authorities,” Pastor Jin Mingri told Reuters news agency at the time. There have also been a string of church demolitions, forced removal of crosses or other arrests over the year. Human Rights Watch said the raids at Early Rain and at Rongguili Church were a further sign that under President Xi Jinping, China is seeking to tighten control over all aspects of society. “As major holidays in many parts of the world – Christmas and New Year – are approaching, we call on the international community to continue to pay attention to the situation of China’s independent churches and speak against the Chinese government’s repression,” said the group’s Hong Kong-based researcher Yaqiu Wang. The Early Rain member who did not want to be identified said the idea of the Three-Self Patriotic churches was “hilarious”, saying they “don’t spread genuine gospel, but spread the thoughts of loving the Party, loving the country”. 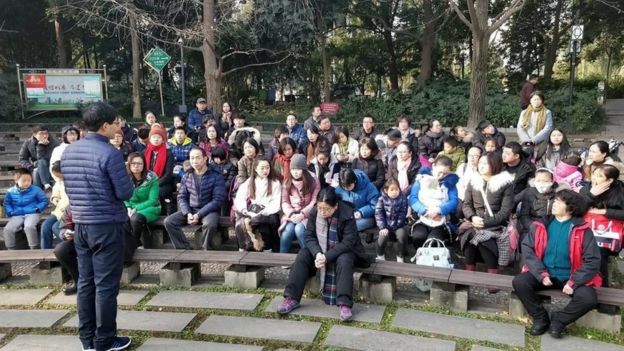 Another Christian in Chengdu told the BBC such churches were “against Jesus, against gospel”. The Early Rain community would survive, he said, but would now go further underground. Ultimately, he said, repression might even increase the profile of the faith in China. 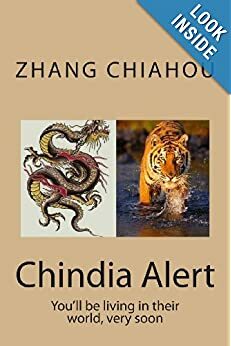 That is according to the local environment department, which said in a statement on Saturday that the men, both surnamed Zhao, were detained by police in Quyang, Hebei province, last week. But later in the day, the local government denied the department’s statement, saying it was “misinformation” and that the authorities had only “criticised and educated the men who burned low-quality coal”. The environment department’s statement was later removed from its official account on social network WeChat. China’s push to clean up its toxic air saw many local governments across the north of the country rush through a coal ban last winter. But a shortage of natural gas to replace coal heating systems left many households shivering in freezing temperatures, forcing the authorities into a U-turn on the ban. Without a reliable energy supply, the ban was relaxed and people in low-income areas were instead asked to choose high-quality coal over the low-end product to reduce emissions. Ahead of winter this year, Quyang – located about 230km south of Beijing – is one of the local governments in northern China that has again cracked down on heating fuel used by families and businesses with a total ban on low-grade coal since late October. It vowed to put a stop to pollution caused by low-quality coal and sent 30 law enforcement officers to villages in the county without central heating in late November to check that people were sticking to the ban, according to a statement on the local government’s website. “Anyone who burns low-quality coal and pollutes the air will be detained and their image will be broadcast on TV so that others can learn a lesson from them,” the Quyang government said on November 27. Since then, county authorities have confiscated 1,147 tonnes of low-quality coal and warned 13 households that have burned it, according to the local government. It is not the first time Chinese have been detained for burning low-end coal or other fuel that is prohibited. In early November, Quyang authorities detained a Xiguo man for five days after police found him burning grass and hay on a hillside in the village. “The hay burning was producing a lot of smoke and polluting the air … so Quyang police decided to detain him for five days,” the local environment department said. County police said the detention was in line with the Security Administration Punishment Act, which states that “residents who do not obey government regulations in emergency or special times shall be detained for up to 10 days”. In a case last winter, a man in Kaifeng, in central Henan province, was detained for eight days in December for burning low-quality coal, according to Bianliang Evening Post. Beijing has said it will be less severe with its pollution curbs this winter as it grapples with slower economic growth and the trade war with the United States. Last winter, it imposed blanket bans on industrial production in the Beijing-Tianjin-Hebei region, which is often the worst affected by choking smog. But in September the environment ministry said it would let steel plants continue producing as long as their emissions met standards.